It's as easy as 1, 2, 3...! You complete the donation information and add gift details. Several gifts can be made in one donation. You review the information entered and add your card details. We send the recipient/s an email (on a date you choose) with your personal message and a link to their 'gift page', allowing them to follow the progress of their nets. Can I make multiple gifts with just one donation? Yes! 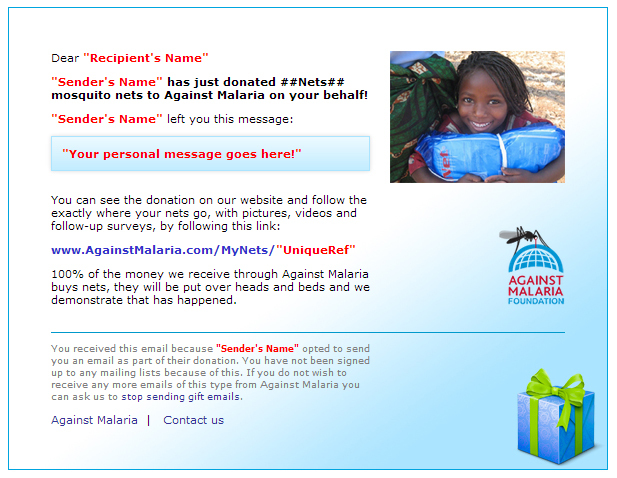 You can add several gifts as part of one transaction and make your own personal donation. Recipient without an email address? No problem! You can still donate and the email you will receive to confirm your donation will have a link that would allow you to print a 'gift card' which you can send to the recipient!